The annual Scholarship Awarding Ceremony of the Yoran-Sznycer Research Fund in Jewish History marking the trailblazing work of students of Jewish and Holocaust history was held at the Chaim Rosenberg School of Jewish Studies. 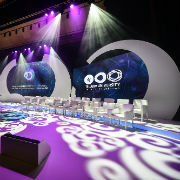 The ceremony recognizes annual scholarships founded by TAU Governor Varda Yoran and the late AFTAU Honorary Director Shalom Yoran. The event was attended by Chair of the Jewish Studies School Prof. Tamar Sovran, Yad Vashem Chief Historian and Head of TAU's Kantor Center for Contemporary European Jewry Prof. Dina Porat, TAU Vice President Raanan Rein and other key faculty members, alumni and students. 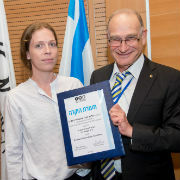 This year’s scholarships were awarded to graduate students Anat Shmoni and Dor Sa'ar and researchers Prof. David Asaf, Prof. Yoram Erder, Dr. Rachel Stepak and Dr. Tal Kogman. Opening the ceremony, Prof. Sovran pointed to a poster of select books and publications on Jewish History produced by Yoran-Sznycer scholars, saying, “This simply would not have been possible without the generosity of the Yoran family. 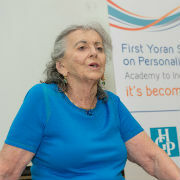 The event’s keynote address by scholarship recipient Anat Shimoni, “Boys and Girls of Auschwitz,” delved into the harsh reality and the specific hardships experienced by young people aged 12-18 in the Nazi death camp. All photos by Israel Hadari.